Under a proposal in the Nebraska Legislature, The public would not know which companies are supplying Nebraska with death penalty drugs. And the head of the state’s court system is stepping up warnings that budget cuts could lead to more prison overcrowding. Lincoln, NE – Senator John Kuehn introduced LB661, which would make information about companies that supply lethal injection drugs exempt from public disclosure. Kuehn said his proposal won’t prevent public discussion about which drugs are used. “It simply protects individuals who manufacture the drug from undue harassment,” he said. Kuehn, a death penalty supporter, says the idea is to prevent what has happened in recent years, when death penalty opponents succeeded in drying up the supply of lethal injection drugs by putting pressure on suppliers. His proposal is already stirring controversy, with a fight over which legislative committee should hold a hearing on the bill. Kuehn said it should go to the Government, Military and Veterans Affairs Committee, since it deals with public records. Others, like Sen. Sue Crawford, said the bill should go to the Judiciary Committee, since it deals with the death penalty. Crawford, a death penalty opponent, said senators consider which committee has the expertise and would provide the best public hearing. But Crawford said political strategy also plays a part in where to send a bill like this. “I think it is the case that it would be more likely to have a better chance of advancing from Government, and it would have a rougher hearing and more scrutiny if it went to Judiciary,” Crawford said. “’Justice Reinvestment’ is the code word for “we-can’t-afford-to-build-a-new-prison-so-we-need-to-find-some-way-to-handle-the-persistently-growing-population-of-convicted-criminals-in-our-prison-system,” Heavican said. Heavican said studies show short prison terms don’t rehabilitate prisoners. “They come back to our local communities and immediately return to using and selling methamphetamine, crack cocaine, and heroin. They physically assault their spouses and abuse their children. They burglarize our neighbors’ homes, shoplift from our local merchants, rob our convenience stores and resort to escalating violence in our largest cities,” he said. But Heavican said it doesn’t have to be that way, if senators maintain funding for probation, community corrections, and other alternatives to prison. He invited senators to talk to people on probation. “Chances are you will hear this: ‘Probation saved my life.’ ‘You saved my family.’ ‘I have a job.’ ‘I’m a positive part of my community,’” Heavican said. “Good community corrections programs work. They save lives and they save money. Keep the good community corrections programs you already have,” he urged senators. If senators approve Ricketts’ proposed budget cuts, Heavican predicted, the court system would “gut” programs to supervise people leaving prison and begin closing centers where they report in for counseling and other services. 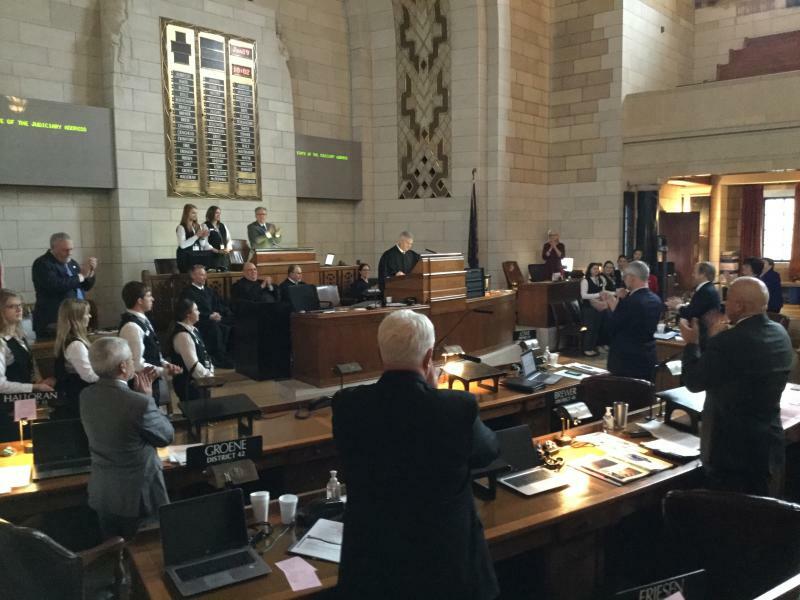 After the speech, Sen. John Stinner, chairman of the Appropriations Committee, reacted to the chief justices plea for continued funding. “He was saying ‘Here’s the outcome. If I don’t have the money, here’s what we have to do.’ And he was expressing that very emphatically what the outcomes are going to be,” Stinner said. “I think that resonates with a lot of people in the body. I think it ties into the priority that the governor has established. And remember …that budget that the governor put out is a proposal. We have the opportunity to take a look at it and set our own priorities,” Stinner added. Ricketts spokesman Taylor Gage was conciliatory, while defending the governor’s proposal. “The Supreme Court has been an important partner with the executive and legislative branches over the last couple of years. And the budget proposal the governor’s put forward maintains their flexibility to continue to prioritize reform going forward,” Gage said. After the Appropriations Committee decides on its budget recommendation, it will be up to the full Legislature to decide how much money the courts will get.